Precious Pages by Paula: TAGS, BAGS, BOXES AND WHATEVER IN 3D! Welcome to this month's blog hop with The Krazy Crafting Crew!! This month we are making Tags, Bags, Boxes and whatever can be made 3D!! Janet is also offering a fantastic giveaway. Here's her description of the giveaway that you DON'T want to miss!! Close To My Heart Cloud Nine Cardmaking Kit. Includes card bases, envelopes, cardstock, double sided paper, a stamp set, and washi tape, glitter tape and other embellishments to make 10 cards! Valued at $45.00! You can win this by leaving comments on each blog, and if you're not currently a follower, why not follow the blogs because there's always fun in this group and a blog hop each month to inspire you! I started out with a size 8 shipping tag which I covered with a pretty SEI aqua and green patterned paper. Next I took some templates and Ranger paint daubers and added two different patterns. I edged the tag with a mint colored felt trim and white lace which I touched up the edges with a hint of Distress Inks. Finally I added a Making Memories sticker that reads 'Spring has Sprung', a Scenic Route chipboard piece that reads 'Welcome Spring', 3 green and yellow Sassafrass chipboard flowers and two Hallmark Disney Tinkerbell stickers which I raised up by mounting on corrugated and adhering with Helmar's dimensional glue dots. Thank you for stopping by and visiting with me today. Please leave each of us a comment and let us know how you liked our hop for your chance to win that awesome prize! my daughter would love that! sooo cute! Love your pretty tag. So "spring". What a very pretty tag! Lots of texture to it! Paula, your tag is GORGEOUS!!!!! What a beautiful tag Paula! Love it!! Wow - I thought you covered the tag in fabric!! Looks great - love using distress inks!! I love it and so would my sister,,she loves Tinker Bell!!! am a new follower!! Wow, a lot of work went into this tag but it was so worth it. It's beautiful! Your tag is adorable!!! I love the lace and trims you used. Thanks so much for sharing. What a darling tag. You decorated it so well. My granddaughter loves Tinker Bell. She would love this tag. Cute tag, love the colors and the tule bow! Pretty - love all the texture and dimension and the ribbons and tulle. Beautiful tag! Pretty colors and frills! 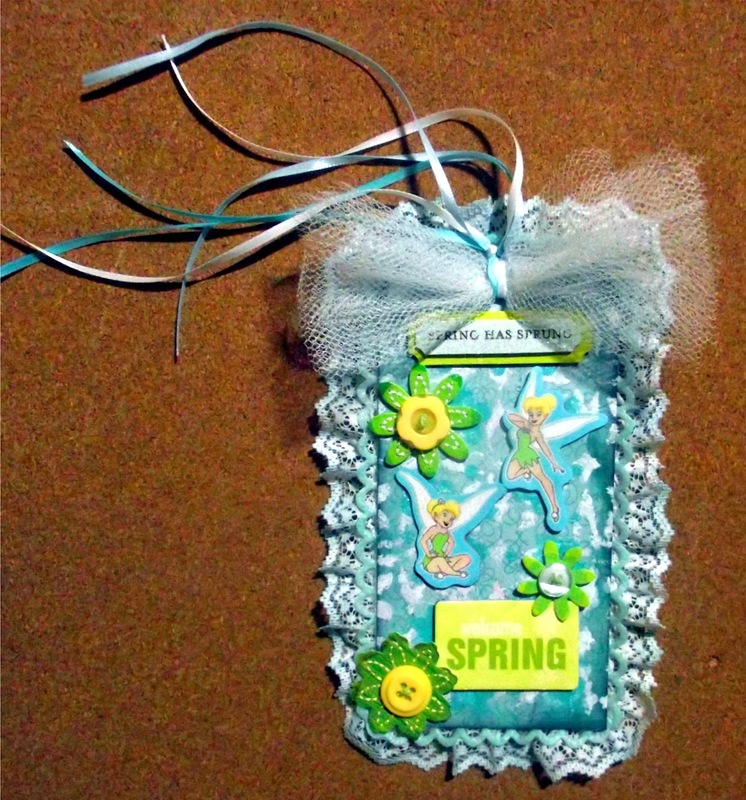 Cute and colorful tag for spring. Thanks for sharing. Makes me think spring may eventually show up! Cute and fun tag.